Canadian Natural Resources (CNRL) has agreed to acquire privately-held Laricina Energy for $0.0815 per share. By the end of the first quarter, Laricina's share capital consisted of 576.6 million shares, valuing the deal at $47 million, excluding assumption of debt. Calgary-based Laricina Energy was founded in 2005 with two core in-situ properties, Germain and Saleski, both located about 100 km southwest of Fort McMurray, AB. The Saleski pilot began operations in 2011 as the world’s first Grosmont carbonate oil sands project. The 1,800 bbl/day facility used solvent cyclic steam-assisted gravity drainage (SC-SAGD) technology, which includes alternating cycles of steam followed by hydrocarbon solvents through a single horizontal well. The company says the pilot helped prove the commercial viability of the process and Grosmont reservoir. Following on the success of the pilot, Laricina began engineering work on a 10,700 bbl/day commercial facility. Engineering on Saleski Phase 1 was about 80% complete before the project was shelved due to a lack of funds. The Saleski pilot produced more than 600,000 barrels of bitumen prior to being shutdown in September of 2015. The purchase may be a strategic move by CNRL, giving it insight into the geological characteristics of the Grosmont Formation, which is Alberta’s second-largest oil sands resource. Most of Alberta's commercial oil sands facilities extract bitumen from the McMurray Formation. Unlike "traditional" oil sands deposits, where sand is saturated with bitumen, Grosmont is a low-pressure highly fractured carbonate formation. Aside from Saleski, Laricina also owns the Germain Commercial Demonstration Project, which also uses SC-SAGD technology. 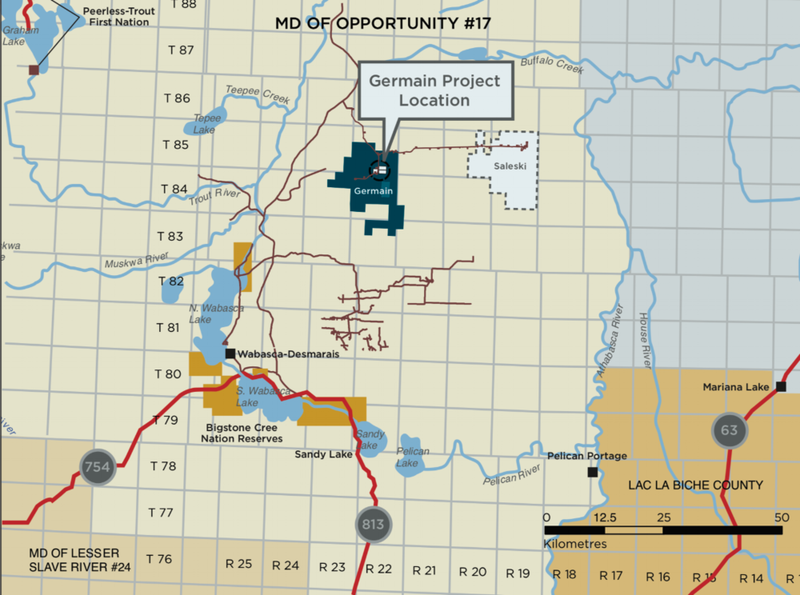 Germain began operations in the summer of 2013, extracting bitumen from the Grand Rapids Formation, which has comparable geological characteristics to the McMurray Formation. Before being shut-in at the end of 2014, the demo plant produced 1,100 bbl/day. Laricina owns 100% of the Germain property and a 60% stake in Saleski, owned jointly with Osum Oil Sands. The Canada Pension Plan Investment Board (CPPIB) was Laricina's largest shareholder, owning 15.3% of the company. The CPPIB pulled Laricina into receivership in March of 2014, after it demanded full repayment of its $150 million loan. The company restructured its debt, sold some of its assets and hired Peters & Co last February to "explore strategic alternatives," hoping to find a joint-venture partner or sell the entire company. The deal with CNRL has already been approved by Laricina's board of directors and is subject to a $2.1 million break-up fee.